Hey folks!! I had a very nice day today, with a few friends. We got together to sew....imagine that...lol!! It was a productive day too....besides laughing and tormenting each other, we made progress. A Do-Nut quilt top....it is such a simple little quilt and very quick. 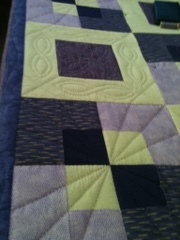 And, I got my blocks pieced for the 100 club quilt. 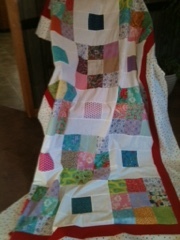 Not the best pic...it is a disappearing nine patch with Whitewashed Cottage fabric. 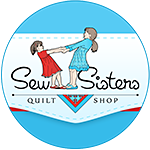 The girls were working on a number of items..mainly quilts of some sort. 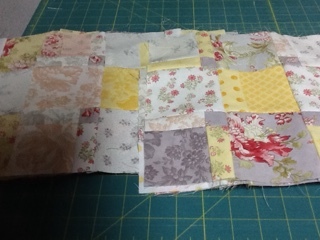 Besides today's projects, I have my pillow finished for this months FMQ challenge, but can't show you yet. It will be posted very soon. 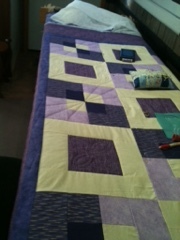 I have a start on Rose's quilt.....hand quilting. Of course, mine are not by Christmas....not this year. Everyone got quilts last year. I think that is it for wips this week. Have a great week...and check out the blogs listed below. Nice work going on, and giveaways!!! 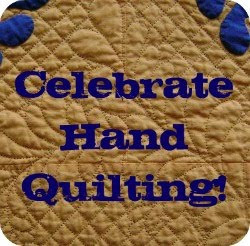 Your hand quilting is looking beautiful, Marjorie. It must be nice to have more indoor time for stitching.